Ploesti was a vast complex of oil refinery facilities located some 30 miles north of Bucharest, Romania. It supplied an estimated sixty percent of the refined oil necessary to keep the German war machine running. In the words of Winston Churchill, Ploesti was "the taproot of German might." It was a strategic target whose destruction allied planners hoped would deliver a severe blow to Germany's ability to carry on the war. 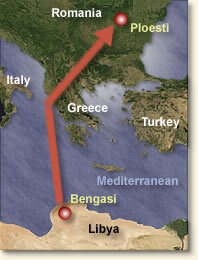 The blow was to be delivered by American B-24 bombers flying out of the Libyan Desert, across the Mediterranean Sea to the target and return - a two thousand mile journey that would push the abilities of both planes and crews to their limits. This would not be the first raid on Ploesti - this had occurred in June 1942 -, nor the last, but it had the highest expectations. Five bombardment groups - two borrowed from the Eighth Air Force stationed in England - equipped with B-24 Liberator bombers began low-level flight training in the Libyan dessert. Flying in formation at altitudes of fifty feet or lower to avoid radar detection and impede enemy antiaircraft fire. Loaded with extra fuel tanks, 178 attack planes struggled aloft from their Libyan airstrips early Sunday morning August 1, 1943. They flew into a fiery hell that would be remembered as "Black Sunday." Trouble began almost immediately. Unbeknownst to the air crews, the Germans had broken their communication code and monitored their flight almost as soon as they took off. As they approached their target, the lead flight made a wrong turn up a mountain valley taking one of the following flights with it. Detected by German radar, the attacking Americans had lost the element of surprise. Arriving on target, the B-24's were confronted with one of the most heavily protected facilities the Germans had. Surrounded by hundreds of anti-aircraft emplacements, heavy-caliber machine guns and defending aircraft, Ploesti's defenses included a specially designed flak train made up of freight cars whose sides could drop revealing anti-aircraft artillery that spewed death from its guns as the train raced in tandem with attacking planes. Smoke stacks obscured by billowing smoke from exploding storage tanks also took their toll on the low-flying B-24s. Fifty-three aircraft - each with a crew of ten - were lost in the attack. Later surveillance flights revealed that approximately forty-two percent of Ploesti's refining capacity had been destroyed. However, it took only a few days for the Germans to bring the complex back to its previous fuel output. "To the very end he gave the battle every ounce he had." "We were very close behind the second flight of three ships. As their bombs were dropping we were on our run in. There in the center of the target was the big boiler house, just as in the pictures we had seen. As the first ships approached the target we could see them flying through a mass of ground fire. It was mostly coming from ground-placed 20 mm. automatic weapons, and it was as thick as hail. The first ships dropped their bombs squarely on the boiler house and immediately a series of explosions took place. They weren't the explosions of thousand pound bombs, but of boilers blowing up and fires of split-open firebanks touching off the volatile gases of the cracking plant. Bits of the roof of the house blew up, lifting to a level above the height of the chimneys, and the flames leaped high after the debris. The second three ships went over coming in from the left, and dropped partly on the boiler house and partly on the cracking plant beyond. More explosions and higher flames. Already the fires were leaping higher than the level of our approach. We had gauged ourselves to clear the tallest chimney in the plant by a few feet. Now there was a mass of flame and black smoke reaching much higher, and there were intermittent explosions lighting up the black pall. I had noticed it just about that moment. I was tired of looking out the front at those German guns firing at us. I looked out to the right for a moment and saw a sheet of raw gasoline trailing Pete's left wing. He stuck right in formation with us. He must have known he was hard hit because the gas was coming out in such volume that it blinded the waist gunners in his ship from our view. Poor Petel Fine religious, conscientious boy with a young wife waiting for him back in Texas. He was holding his ship in formation to drop his bombs on the target, knowing if he didn't pull up he would have to fly through a solid room of fire with a tremendous stream of gasoline gushing from his ship. I flicked the switch intermittently to fire the remote-control, fixed fifty caliber machine guns specially installed for my use. I watched my tracers dig the ground. Poor Pete. How I wished he'd pull up a few hundred feet and drop from a higher altitude. As we were going into the furnace, I said a quick prayer. During those moments I didn't think that I could possibly come out alive, and I knew Pete couldn't. Bombs were away. Everything was black for a few seconds. We must have cleared the chimneys by inches. We must have, for we kept flying - and as we passed over the boiler house another explosion kicked our tail high and our nose down. Fowble pulled back on the wheel and the Lib leveled out, almost clipping the tops off houses. We were through the impenetrable wall, but what of Pete? I looked out right. Still he was there in close formation, but he was on fire all around his left wing where it joined the fuselage. I could feel tears come into my eyes and my throat clog up. Then I saw Pete pull up and out of formation. His bombs were laid squarely on the target along with ours. With his mission accomplished, he was making a valiant attempt to kill his excess speed and set the ship down in a little river valley south of the town before the whole business blew up. He was going about 210 miles per hour and had to slow up to about 110 to get the ship down. He was gliding without power, as it seemed, slowing up and pulling off to the right in the direction of a moderately flat valley: Pete was fighting now to save himself and his men. He was too low for any of them to jump and there was not time for the airplane to climb to a sufficient altitude to permit a chute to open. The lives of the crew were in their pilot's hands, and he gave it everything he had. Wells, in our waist gun compartment, was taking pictures of the gruesome spectacle. Slowly the ship on our right lost speed and began to settle in a glide that looked like it might come to a reasonably good crash-landing. But flames were spreading furiously all over the left side of the ship. I could see it plainly, as it was on my side. Now it would touch down-but just before it did, the left wing came off. The flames had been too much and had literally burnt the wing off. The heavy ship cartwheeled and a great shower of flame and smoke appeared just ahead of the point where last we had seen a bomber. Pete had given his life and the lives of his crew to carry out his assigned task. To the very end he gave the battle every ounce he had. This eyewitness account appears in: Ardery, Philip, Bomber Pilot (1978); Dugan, James and Carroll Stewart, Ploesti (1962). "Bombing Raid on Ploesti, 1943," EyeWitness to History, www.eyewitnesstohistory.com (2008). The August 1 raid on Ploesti was code-named Tidal Wave. Five Congressional Medals of Honor were awarded for the mission - three posthumously. This is the most awarded for a single combat mission. 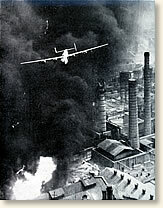 Although further air raids were launched, the output of Ploesti refineries was not squelched until the Soviet Army overran the facility in August 1944.